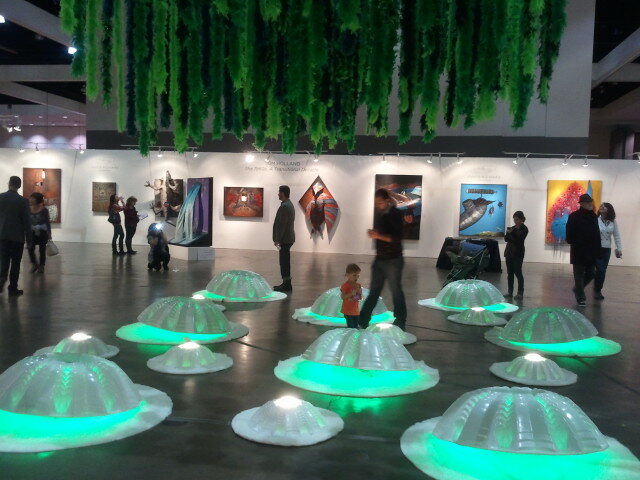 Today, Sunday, is the last day of the 2012 LA Art Show. A visit pays off for the whole family! There is so much to see that not only kids are busy watching but also participating. It’s an experience to watch so much different art of all kinds of styles at one place. There are also special events offered throughout the day. From printmaking to fine art lectures. Some showcasing galleries have some of their artists present and one can engage with the artists, talk about their art and find out more about them and their work first hand. 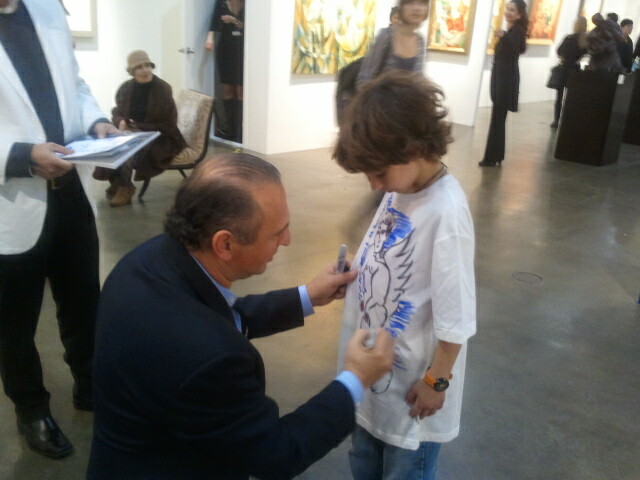 Corzine Fine Art (Booth B140) had a special event: Artist Yuri Yuroz decorates white T-shirts (don’t forget to bring one with you!) with a painting. On another side of the exhibition hall, James Peterson’s spectacular installation ‘Hypoxia’ is attracting admirers of all ages. Children are in heaven here since the artist actually encourages them to touch and experience his artwork. In fact interaction with his installation is necessary to bring the installation ‘to life’: Touch causes certain lights to turn on in parts of the installation while sudden blows of air create unexpected movement.